Everywhere that U.S. leadership helped Islamic jihadis topple secular autocrats in the name of "democracy and freedom," indigenous Christian minorities are forced either to convert to Islam or die. Targeting Christian children in Iraq goes back to soon after the ousting of Saddam Hussein. In June 2008, a Canadian parliamentary committee heard about how "militant Muslims" were crucifying Christian children: "Since the war began in 2003, about 12 children, many as young as 10, have been kidnapped and killed, then nailed to makeshift crosses near their homes to terrify and torment their parents." "The photo I was sent today was the most awful I have ever seen. A family of 8 all shot through the face lying in a pool of blood, with their Bible open on the couch. They would not convert. It cost them their life." "Abouna, abouna [father, father] I said the words! Does that mean Jesus doesn't love me anymore? I have always loved Jesus but I said those words because I couldn't see my children being killed!" "No Elias," White said. "Jesus still loves you -- he will always love you." In 1389, a great procession of Copts who had accepted Muhammad under fear of death, marched through Cairo. Repenting of their apostasy, they now wished to atone for it by...returning to Christianity. So as they marched, they announced that they believed in Christ and renounced Muhammad. They were seized and all the men were beheaded one after another in an open square before the women. But this did not terrify the women; so they, too, were all martyred (Crucified Again, pgs. 113-114). "The name of Jesus was their last word... With that name, whispered at the very last, their martyrdom was sealed. Over one month before the video appeared, the BBC had falsely reported that the majority of those now slaughtered Copts were "released." Sadly, such downplaying of Muslim persecution of Christians is standard for the BBC. "We say to Christians everywhere, the Islamic State will expand, with Allah's permission. And it will reach you even if you are in fortified strongholds. So whoever enters Islam will have security... But whoever refuses will see nothing from us but the edge of a spear. The men will be killed and the children will be enslaved, and their wealth will be taken as booty. This is the judgment of Allah and His Messenger." The next scene portrays the captive Ethiopian Christians being shot in the back of the head or having their heads carved off. 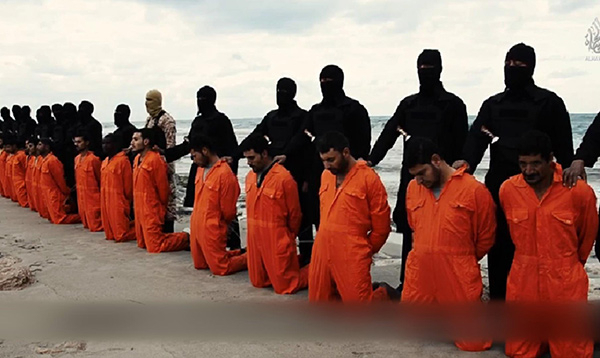 The ongoing slaughter of Christians by the Islamic State, and the destruction of churches and antiquities, must be laid at the feet of those Western nations that, intentionally or unintentionally, paved the way for the Islamic State. Instead of the triumph of democracy and progress, we got violence, poverty and social disaster -- and nobody cares a bit about human rights, including the right to life. I cannot help asking those who have forced that situation: Do you realize what you have done? Whether they realize it or not, they continue to do it in Syria -- with Christians often paying the highest price. Gaza Strip: Christians in Gaza protested over the "kidnappings and forced conversions of some former believers to Islam." The ever-dwindling Christian community banged on a church bell while chanting, "With our spirit, with our blood we will sacrifice ourselves for you, Jesus." Pakistan: In 2004, a two-year-old child was raped because her Christian father "refused to convert to Islam." Another "devoted Christian" was butchered by Muslim men "with multiple axe blows [24, according to the autopsy] for refusing to convert to Islam." In April 2014, a Muslim security guard murdered a Christian worker who refused to convert to Islam. Uganda: After a gang of Muslims brandishing machetes stormed a church during service. They hacked one 18-year-old woman to death and left three others, including a one-year-old baby, injured. The pastor explained that the attackers belong to a local "group of Muslims" who seek "to transform [Christian-majority] Uganda into an Islamic nation and would kill anyone who refused to convert." Nigeria: A Christian teenage girl told how Boko Haram came to her household and slaughtered her father and brother because they refused to convert to Islam. After abusing her, they tied her up and left her in a state of shock between the two corpses. Bangladesh: After shutting down the construction of a church, a local government official threatened Christians with eviction from their village unless they renounced their faith and embraced Islam. Said one of the Christians: "Their threats chilled me to the bone. That is why I pretended to accept Islam, but faith in Christ is the wellspring of my life." Another said: "The chairman is clipping the wings of our faith. I do not know how long we can grin and bear it. We want religious freedom. We want to practice our religion freely." Russia: In Tatarstan, a Muslim-majority republic in Russia, seven churches were burned and "increased pressure on Christians to convert to Islam" was widespread. Uzbekistan: A 26-year-old Christian woman, partially paralyzed from youth, and her elderly mother were violently attacked by invaders who ransacked their home, confiscating "icons, Bibles, religious calendars, and prayer books." At the police department, the paralyzed woman was "offered to convert to Islam." She refused and was accordingly fined almost two years' worth of her wages.